Pastor J.R. Thicklin is quite literally a Son of Selma. The 50- year-old West Palm Beach pastor and CEO of Destiny By Choice, a domestic violence advocacy group, went back to his birthplace last weekend to commemorate the 50th Anniversary of “Bloody Sunday.” It was the day in 1965 when thousands of ‘colored folks’ attempted to cross the Edmund Pettus Bridge from Selma to Montgomery, Alabama, marching for the right to vote. On that fateful day, however, the crowd was met by scores of policemen who pelted them with Billy clubs and tear gas, leaving many of them slain on the ground, gushing blood. But later that year, the marchers proclaimed victory when the historic Voting Rights Act was passed. But many marchers said the weekend marked a new day in history as they were amazed that 50 years later, the first black president of the United States, stood at the foot of the bridge, speaking about the throngs race relations. The marchers said President Obama’s presence in Selma demonstrated how far the nation has come. His presidency, they say, marks a beacon of light in light of our bloody history. 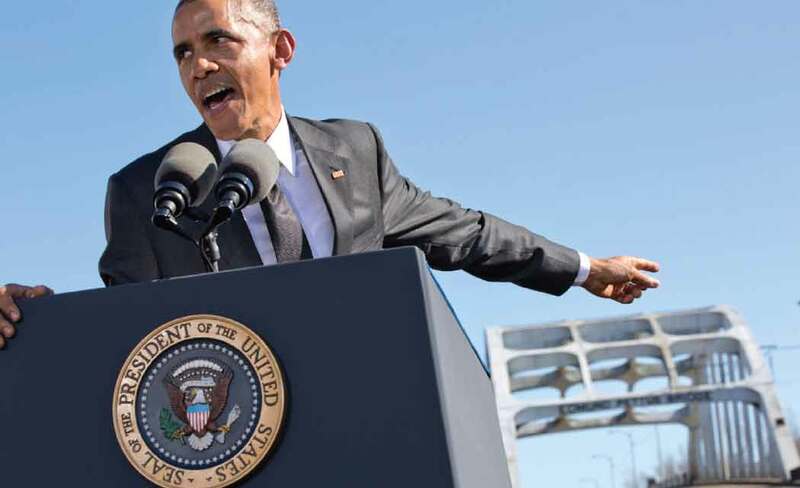 “So much of our turbulent history – the stain of slavery and anguish of civil war, the yoke of segregation and tyranny of Jim Crow, the death of four little girls in Birmingham and the dream of a Baptist preacher – met on this bridge,” Obama told the crowd, before he took a symbolic walk across part of the Edmund Pettus Bridge, where violence had erupted 50 years earlier on March 7, 1965. “It was not a clash of armies, but a clash of wills, a contest to determine the meaning of America,” he said. People came from around the nation to commemorate the anniversary. Groups representing NAACP branches, church groups, social and civic organizations and families and friends descended on Selma. Some came on buses while others drove their cars miles to be there, many bringing children and grandchildren to witness a new day and time. The Selma fire department estimated the crowd at 40,000, but others say there were as many as 100,000. Whatever the number, Thicklin, a son of Selma, was among them – determined be in his hometown retracing history that took place so many years earlier. It’s the place where the pastor was born, raised, and attended high school. He was just six months old when “Bloody Sunday” took place. His mother didn’t attend the march back then, because her employer threatened to fire her if she attended. Thicklin said many employers threatened their workers back then, insisting they not get involved with the march. His nine year old brother did, however, attend back in 1965. So what did it mean to Thicklin to see so many people descending on the place he knows as “home?” “I felt an overwhelming sense of discovery. It was a place that had enormous history, yet there was so much inspiration.” And so much change in Selma, he discovered. “Fifty years later, there’s so many differences, yet so many similarities,” he noticed. Unfortunately, Thicklin said, many of the schools in Selma are once again segregated, signaling the city has gone backwards in some ways. “That’s unfortunate,” he said. But another proud moment for Thicklin was seeing one of his high school classmates enjoy a prominent role in the weekend’s commemoration. U.S. Congresswoman Terri Sewell, (D-Alabama) was among the leaders of the delegation of Congress. Sewell and Thicklin went to high school together. She is a native of Selma also, who graduated from Princeton, Oxford University and Harvard Law School. She is a public finance attorney and went on to become the first black woman from Alabama to be elected to Congress. “There was a sense of pride there, too,” he said of his classmate. Meanwhile back in South Florida, U.S. Congresswoman Frederica Wilson of Miami, did not attend the march in Selma, but commemorated the occasion by offering a private screening of the movie, Selma, for 500 members of her 5000 Role Models of Excellence project. The private screening was held at the Grand Cobb 18 Theater in Miami Lakes on Friday, March 6th. Before the movie, Wilson held a discussion about the Selma march and the Civil Rights Movement. During the movie, the Role Models launched a “Twitter Storm,” tweeting their feelings about the movie and expressing their thoughts, said Wilson’s Director of Communications, Gwen Belton. Belton said they received a tremendous amount of participation on Representative Wilson’s Twitter account and also on the 5000 Role Models Twitter feed. She said the experience was a huge success for the mentees, and they learned an important part of our history. The release of the movie Selma, late last year, helped stir up interest in the 50th Anniversary of “Bloody Sunday.” The movie’s theme song, “Glory,” by recording artist John Legend, and rapper, Common, won Best Original Song at the 87th Annual Academy Awards this year, as well as a Golden Globe Award. Oprah Winfrey was among the producers of the movie. Winfrey’s Director of Communications, Chelsea Hettrick, said Winfrey had no plans to attend the 50th anniversary celebration in Selma.